Photos submitted by Sarah Goocey Clare Odbody, the guardian angel portrayed by Payton Burkhammer, tries to talk sense into George Bailey, portrayed by Alex Bauerbach. The story of “everyman” George Bailey is a classic Christmas favorite that will be brought to the stage this weekend by the Mid Ohio Valley Players youth theater. “It’s a Wonderful Life,” a stage play adapted by James W. Rodgers, is based on the 1946 film by Frank Capra, which starred Jimmy Stewart, Donna Reed and Lionel Barrymore. 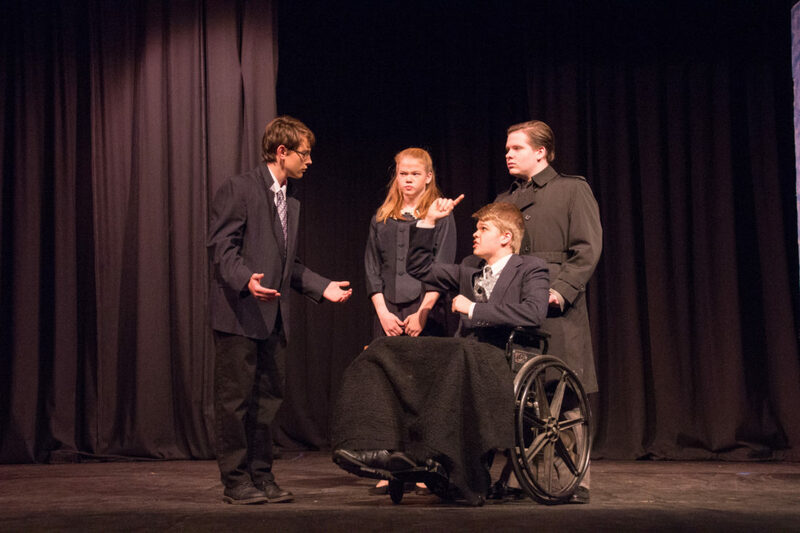 The local production will star high school students Alex Bauerbach, as George; Madi Moore, as Mary Hatch; and Max Schafer as the villainous Mr. Potter. The other familiar characters, including Bert the cop and Ernie the taxi driver, Sam Wainwright, Harry and ma Bailey, Uncle Billy and all the colorful townspeople will be brought to life by students from all over the valley. Oh, and one can’t forget George’s guardian angel, with a twist. Clare Odbody will be portrayed by Payton Burkhammer, a 17-year-old senior at Parkersburg High School, in her final season with the youth theater. The program is open to sixth- through 12th-graders. “It is kind of sad this being my last show but I enjoy being a senior (in the program) because I get to mentor the younger kids,” Burkhammer said. Left to right: Alex Bauerbach, as George Bailey; Sydney Gammon as Potter's secretary; Maxwell Schafer, as Mr. Potter; and Davey Thrasher, as Potter's goon, in a scene from "It's a Wonderful Life." Changing things up and making the beloved angel Clarence into a female didn’t require much other than changing the name and a few pronouns. Clare helps the main character, George Bailey, when the path of his life takes him on a detour into despair. Alex Bauerbach, a relative newcomer to the theater, is taking on the challenging role of George, portrayed in the movie by Stewart. 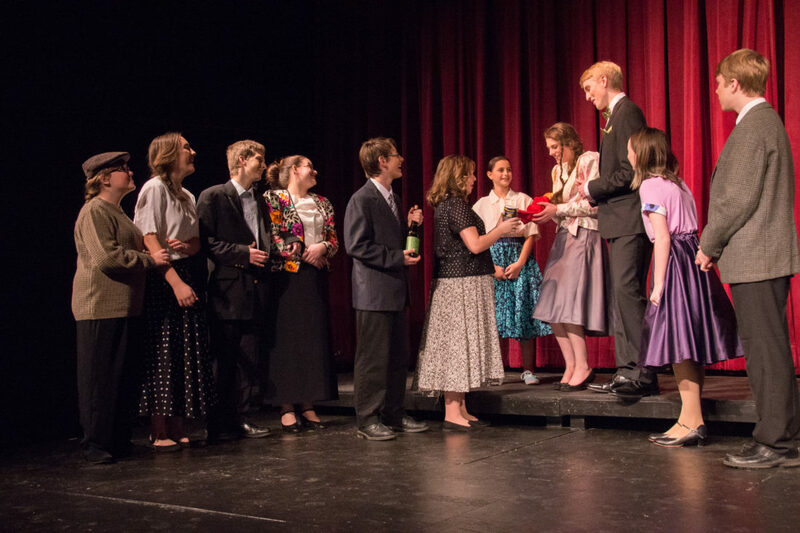 Townspeople, played by members of the MOVP Youth Theater, congratulate George and Mary Bailey on their marriage. Bauerbach said the last show he was in was “Toy Camp” with the MOVP Junior Players, about eight years ago. “My mom saw the information for (Wonderful Life) in the newspaper and thought I should audition … I was really surprised to be given this part,”he said. The biggest challenge, according to Bauerbach, has been learning all of George’s dialogue. Erik Helander, a 17-year-old Swedish exchange student attending Monroe Central High School, is cast in the role of Mr. Martini, a bartender who is generous and friendly, or on the flip side of George’s life, stingy and mean. Helander’s host in the United States also happens to be director George “JR” Wells. “I put on my letter (for the exchange program application) that I was interested in doing drama … it just fits that George (Wells) is the director,” he said. Mr. Martini is supposed to be an Italian immigrant in the show but Helander plays him a little differently. “We made him more Swedish because it was hard for me to get the accent,” he said. For Helander, Bauerbach and Burkhammer, getting to know their fellow cast members has been the most rewarding part. The show, directed by JR Wells, Susan Boyer and Stephanie Winland, will be presented one weekend only: this Friday and Saturday at 7 p.m. and Sunday at 3 p.m. The Players Theatre is located at 229 Putnam St. Tickets are $8 and $6 and can be purchased at Marty’s Print Shop, the theater box office, the CVB and online at midohiovalleyplayers.org. 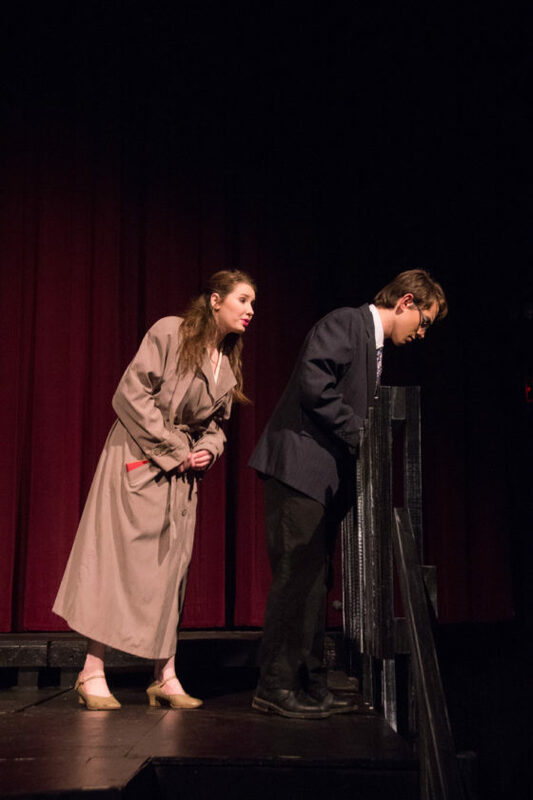 Photo submitted by Sarah Goocey Alex Bauerbach, as George Bailey, and Madi Moore, as Mary Hatch, perform a scene from the MOVP Youth Theater production of “It’s a Wonderful Life,” opening Friday. When: Friday and Saturday at 7 p.m., Sunday matinee at 3 p.m.
Tickets: $8 adults, $6 youth; available at Marty’s Print Shop, the Marietta-Washington County Convention and Visitors Bureau, www.midohiovalleyplayers.org or at the box office prior to showtime.